I really was in the mood for skirts and shoes. And nothing could change my mind even fact that temperature had dropped and weather wasn't very friendly for this outfit. Yet, I pulled out my secret weapon- super cozy tights from primark (they're the best for this type of weather) and cozy chunky knit jumper which my fiance kindly got for me. He just didn't want me to let leave shop without it and I'm so grateful him for that. I love those gorgeous sleeves such a romantic touch to simple jumper. I'm all about the unconventional jumper or top. Something that paired with plain old jeans still makes the outfit special. This outfit is winter perfection - the skirt is so chic, the sweater so cosy! The perfect pairing. You are right the sweater has a nice sleeve detail. You look great and I would not know from the pictures that you might have been freezing:) even so, i am sure it was worth it. No matter how brutal the weather is, it feels good to dress up, right? Those sleeves!!!! I love fun touches like that. You look so cozy! The sweater and sleeves are gorgeous! Great skirt Ra and I love your shoes! Such a beautiful look. Nice look, I love the shoes and the skirt. I love the outfit! You look really pretty! I can totally relate to just NEEDING to put on a skirt and heels, regardless of the inhospitable weather. Glad you have the cozy tights to get the job done! Love the mix of the leather skirt and the chunky sweater too! Beautiful outfit dear! that skirt is gorgeous! Cool shots! 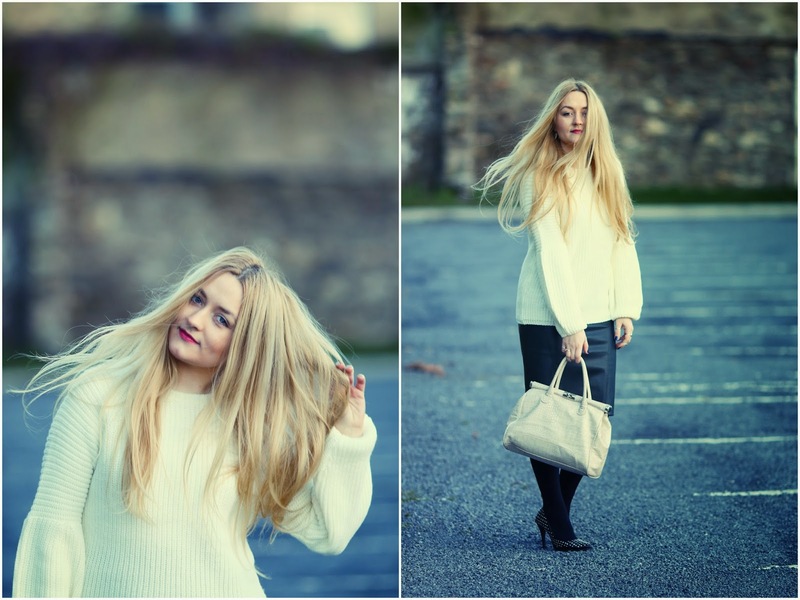 Love the bulky sweater over the midi skirt! Šis tiešām ir ļoti interesants un oriģināls džemperis- piedurknes ir vienkārši lieliskas! Bonusiņš Tavam vīram- cik jauki no viņa puses! :) Cik es esmu novērojusi tad zvanveida formas ir pašlaik ļoooti populāras modē un, ja godīgi, tad man prieks, jo šāda veida formas ir lielisks atsvaidzinājums jau pierastajām lietām! Un wow, Tev šajās bildēs mati izskatās fantastiski!